Principal Cast : Kevin Costner, Jennifer Garner, Denis Leary, Frank Langella, Tom Welling, Chadwick Boseman, Rosanna Arquette, Sam Elliot, Ellen Burstyn, Terry Crews, Arian Foster, Griffin Newman, Patrick St Esprit, Chi McBride, Kevin Dunn, Sean Combs, Josh Pence. 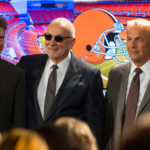 Synopsis: The General Manager of the Cleveland Browns football team must balance his personal life with the business of recruiting the best talent possible during the key NFL trade period – draft day. What we think : Costner delivers a heartfelt performance in this near-indecipherable football-talk film, a film devoid of any depth (and actually nearly condoning assault and battery charges as a part of the lifestyle) in this NFL-sanctioned love-letter to big business. Although I had no idea was was going on most of the time (especially with the football-y specifics, because nobody cares about the NFL outside of America, do they?) the passion with which the film delivers its genteel message is noticeable and tangible. Hardly a classic, but worth a look for fans of American football. From the director of Ghostbusters, Kindergarten Cop and Stripes comes a film about….. the NFL Draft. Okay, so I can admit to not knowing a thing about American football (Gridiron to my Aussie readers) other than what I’ve seen through the lens of Hollywood’s fascination with the sport. With bizarre player positions, weird defense/offense sub-teams and rules that make no sense whatsoever, the fact that the Superbowl, the NFL’s “Oscars”, if you will, is as successful as it is, is perhaps testament to clever marketing more than it is about the actual game. Yeah, I’m not knowledgeable about the NFL or its format, which probably makes me the least qualified person to determine the accuracy or technical proficiency of this film – Draft Day is centered almost completely around the televised drafting of potential NFL players into teams, held on a single day in New York City. I can also admit that a lot of Draft Day went right over my head; the language of American Football is utterly foreign to me in terms of plays, team structure or even the nature of the draft itself, so I was relying on the film to “fill in the blanks” for those of you in similar positions to myself. After all – weird as this is – not everyone follows the NFL. Draft Day’s particular genre aside, is it a worthwhile sports film, or is would it be best served spending time on the bench? Costner’s film choices have ranged from great to terrible across his career, so the fact it stars him isn’t an absolute guarantee of “greatness”; but he’s generally solid even in the dreck. Hall of dreams….. Cavern of nightmares. It’s NFL Draft Day, a day when all the American football teams come together to pick the new recruits from the college systems’ most successful applicants. 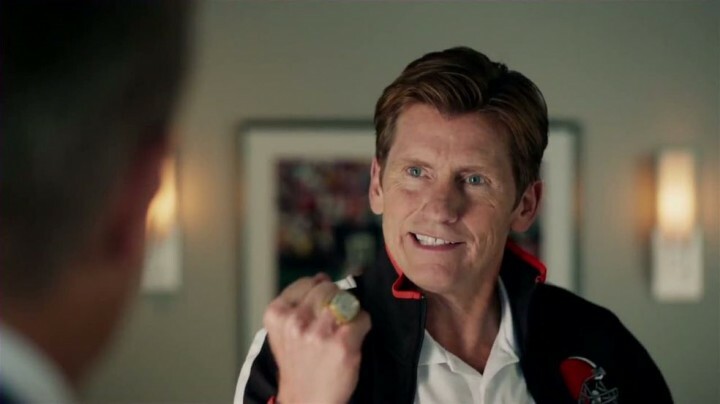 General Manager of the Cleveland Browns, Sonny Weaver Jr (Kevin Costner) has just discovered he’s about to be a father, with secret girlfriend (and Browns’ lawyer) Ali Parker (Jennifer Garner), while trying to build a team for Coach Vince Penn (Denis Leary) and “make a splash” for team owner Nathan Molina (Frank Langella). Through a negotiation with Seahawks GM Tom Michaels (Patrick St Esprit), Weaver snags the top draft pick – commentators believe young star Bo Callahan (Josh Pence) will go at pick #1, a sentiment shared by everyone else within the NFL. 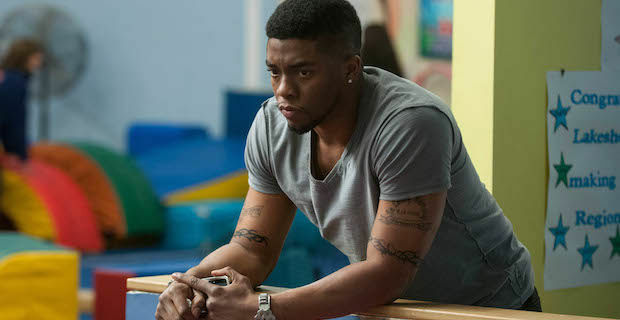 With a bargaining chip like the #1 pick, Weaver begins to bargain for other players to fill the roster, revolving around defensive player Vontae Mack (Chadwick Boseman), and the Browns’ current quarterback Brian Drew (Tom Welling). As negotiations permute throughout the course of the day (each team is given ten minutes to official “pick” their next player in each round), the tension rises as Weaver not only tries to get the best players for the Browns, but maintain an edge over the other teams for years to come. Draft Day is one of those All American Sports Films. You know, the kind that waves the flag of patriotism, swamps itself in parochial oligarchic tribalism, and delivers somewhat schmaltzy predictability with its heart proudly on its sleeve. Draft Day isn’t excatly definitive in terms of sporting films, nor is it invigorating with fresh ideas or even old ones with a new slant; Draft Day is best described as “mild”, a film with passion but no energy, and although it succeeds in making the NFL Draft seem fairly bland (when I seriously doubt it is), the genteel nature of the script ensures that it’s fairly family friendly to its most obvious audience demographic. 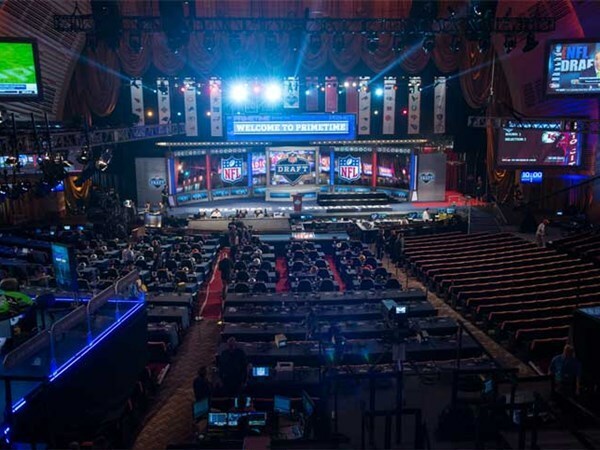 Draft Day could easily be explained away as a smooth promotional ploy by the NFL, to soften the appeal of a code rocked by scandal and innuendo. Recent cases of players engaging in spousal abuse and other offensive behavior is, as with most major sporting codes, it seems, waved away as “boys being boys”, and at one point in this film that aspect of the NFL is given a pointed, awkwardly prescient mention, yet for all the potential to really dig into the too-ing and fro-ing of the various NFL teams, Draft Day feels largely vanilla. There’s passion behind the camera, one suspects, and no doubt the film’s budget was covered by the sponsorship logos and product placement (and it’s egregious at times), but little soul exists in this marketing exercise. That’s a shame, because other films have done this kind of thing a lot better; that’s not to say Draft Day is an inherently bad film, rather it just seems afraid to really go the distance with any significance, content instead to smile-and-wave itself into mediocrity. Don’t try and be a hero, dude. The story hangs on the loose thread of Costner’s grumpy team manager character, and his various personal issues through the team; Weaver was forced to sack his own father, the former coach, in his second year of his involvement in the team, while his mother and ex-wife are distant from him for this fracture, and Ali’s sudden pregnancy throws his life into turmoil as well. Although these narrative threads allow audience empthay to develop, the film never really tries to generate angst from them. Instead, Reitman’s film uses these things as manhole covers for the gaps between the thing you’ve really come to see – Costner presiding over the drafting of recruits to the Cleveland team’s roster, and all the permutations involved. 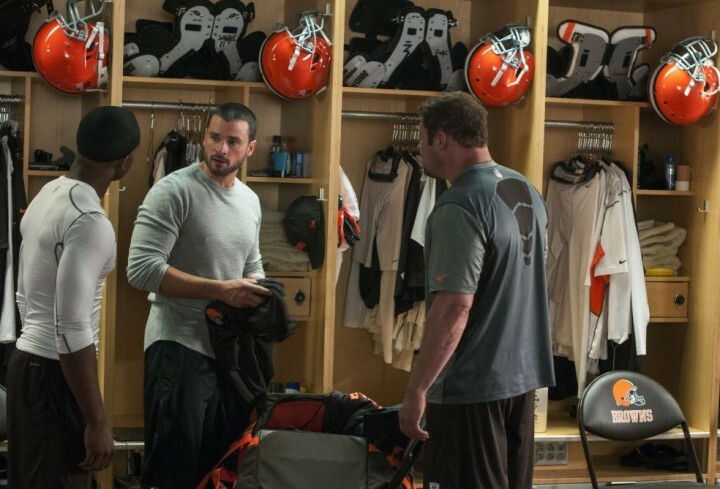 With a gentle smattering of real-life NFL personnel to add fan service to the movie, and some bit-parts to actors of quality like Kevin Dunn and Chi McBride (really, these guys must have just been in it for the paycheck), Draft Day’s magnanimous tone helps it appeal to the fanboys more than any newbie watching – like me. Costner, who gives this film an edge sadly missing whenever he’s not on screen (which is rarely, thankfully) is the lone shark in this thing; the rest of the cast react to him, and provide some narrative chicanes on which much of the tension rests. Denis Leary is solid as a born-again coach, Frank Langella does nicely as the big-chested small-hearted team owner, Jennifer Garner is sweet enough as Ali, Costner’s romantic interest, although they have zero screen chemistry together, while Tom Welling, Rosanna Arquette (who must have owed Reitman a favor) and Ellen Burstyn (as the Weaver matriarch) add much needed sparkle to the otherwise dullard story points. Kudos also to unsung hero Griffin Newman as one of the funniest parts of the movie, playing a nervos intern assigned to help Weaver through his day – it doesn’t go to plan, obviously – and a shout out to Sean Combs (yeah, one-time P Diddler or whatever the hell he’s calling himself these days) for not screwing up his small role as a player manager. Seriously you guys, where did you put my spare keys? Draft Day’s middling flavor of arch-sentimentality of the old Boys Club teamster stuff feels nice, I guess, and will appeal to the code’s fans, but to outsiders it will appear somewhat disingenuous and manipulative. 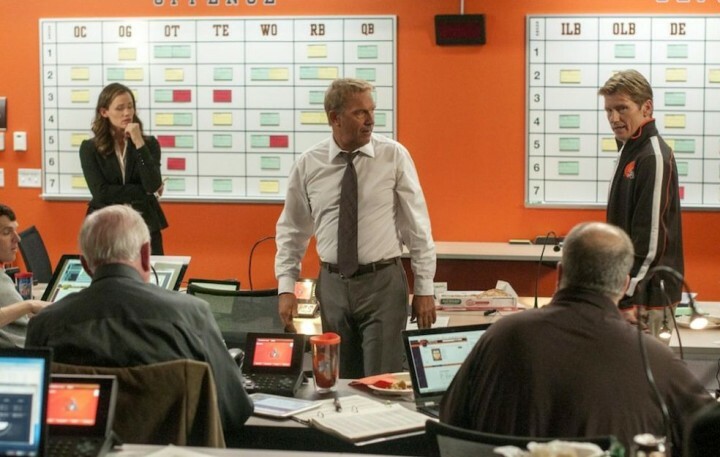 If Michael Bay is the American Military’s inside propagandist for action films, then Draft Day does similar things to the NFL’s recruiting process. Reitman’s softly-softly approach delivers mild laughs, some sweet-natured tension around team owners and managers conflicting through adversity, and Costner’s natural charm as the archetypal Team Man steering his crew through the waters of the unknown, make the film pleasant without being controversial. The fact that I enjoyed it at all is testament to how well made it is, but even so, I got the feeling that I was being spoken at, rather than invited into, a world I know nothing about. Draft Day is complimentary to an industry that’s had a bad rap lately – whether you’re cynical enough to see through it will determine your enjoyment and/or appreciation of it. It's one of those films that automatically excludes a large section of its audience by being so specific in its narrative. It's still good, but I think you need to be a fan of all things NFL to get it.